The season is upon us…Wedding Season! Simply Chic is getting prepared for spring weddings! To start, we are partnering with a new venue, Whitefish Lake Golf and Grill in Pierson. We will have our covers on display at their tasting event this Saturday, March 5 at 6pm. We are also working on booking weddings for the spring, summer, and fall! Many dates are booking up quickly, so get in touch with us soon to see if your date is still available. We usually can accommodate only two weddings per weekend with our full service package. At only $1.50 per cover, it’s the best deal in town. Send us your contact information and we will be in touch to let you know if your date is still open. And if you’re interested in seeing pictures from recent weddings we’ve done, visit and LIKE our Facebook page! Happy planning to all the brides out there! We had a blast this year helping couples all over West Michigan! Check out this link to see pictures of some weddings from this season. We are currently booking for 2016 and beyond! Contact us today for a quote. We have one month left for our Winter Special! We are offering black or white spandex chair covers for only $1.00/cover! The special is only good THIS MONTH! The special is for our Do-It-Yourself package only, but it’s a steal. If you’re getting married and looking for one last minute touch to add to your reception, chair covers may be the best (and most affordable) option! Give us a call today, 616-893-6524! Or Email us through our contact page! Grand Rapids Bridal Show 2014! 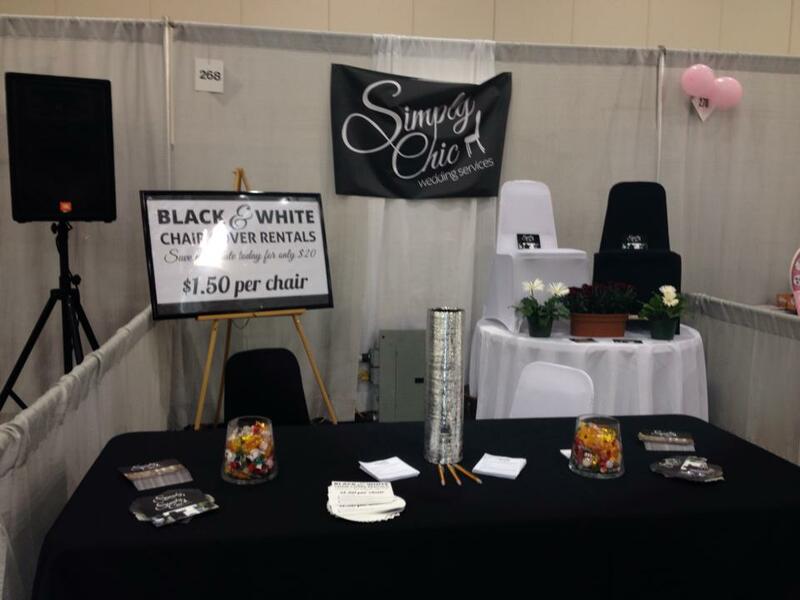 We had SO much fun hosting a booth at the Grand Rapids Bridal Show this weekend. It was held at the Devos Center right in the middle of downtown GR. The town was crazy busy with all the folks checking out ArtPrize, but so many brides were still able to get through the crowds and into the show. Thanks so much to all the brides who visited our booth. We are looking forward to hearing from all of you about helping transform your weddings. Please check out our Facebook page for LOTS of pictures of real weddings. And send us an email through our contact page if you’re interested in booking with us. Dates are filling up for 2015, and also for 2016! 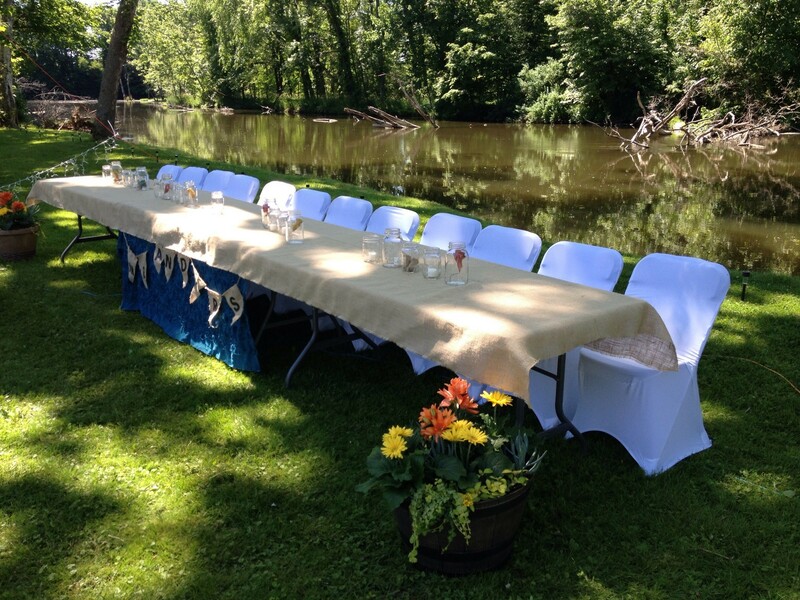 We headed out to Lowell, MI today to set up for a couple who was married a couple weeks back! The couple had a destination wedding and honeymoon, and came back to town to celebrate with friends and family. They chose Deer Run Golf Club as their reception venue! This rustic setting overlooks the beautiful grounds of the golf course and lets in tons of beautiful sunlight. The room was decorated with single stems of a variety of yellow flowers, lanterns, chalkboards, and mason jars. The bride and groom made every table unique by placing a photograph of themselves in a mason jar filled with colored water! 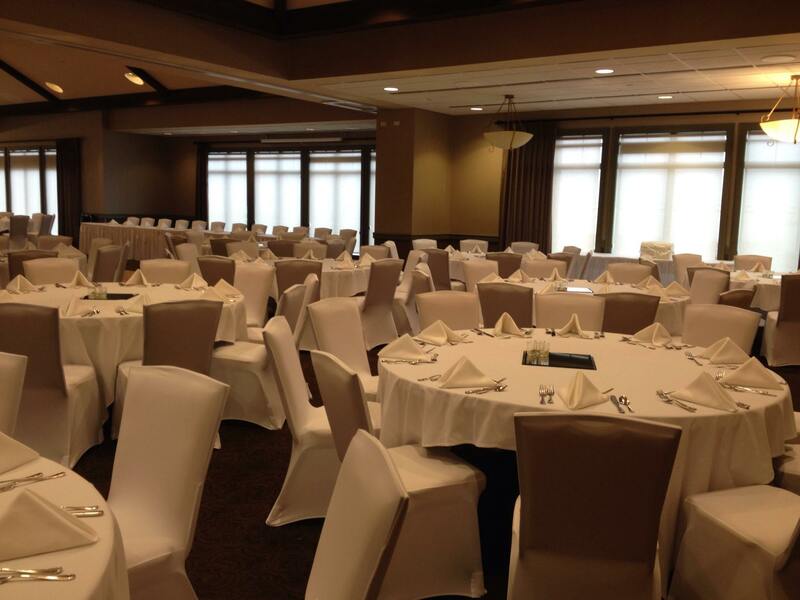 Unfortunately, the banquet chairs in the room did not match the decor…Simply Chic to the rescue! 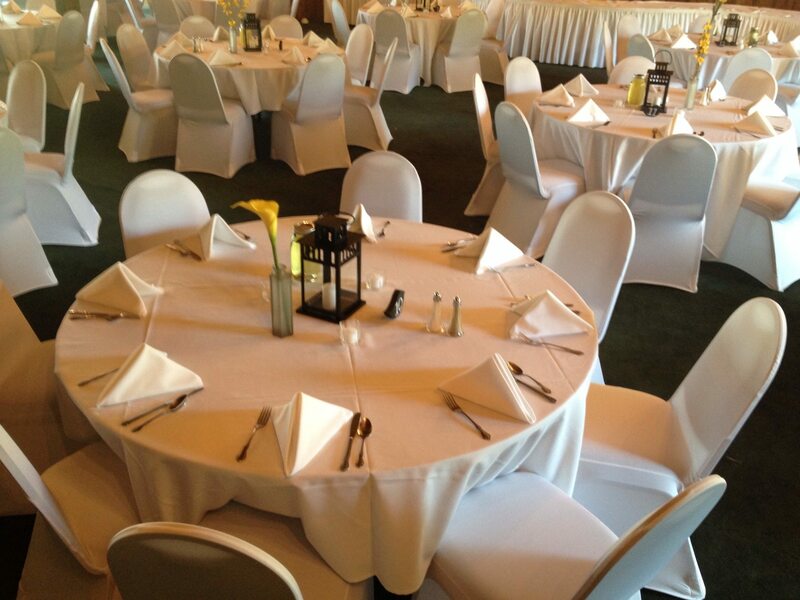 We were able to cover the mint green chairs with our white covers, making the room elegant and bright. We wish the bride and groom our congratulations on their marriage and wish them all the best!